The Project Red team up in lights at the 2018 Premier’s Awards. 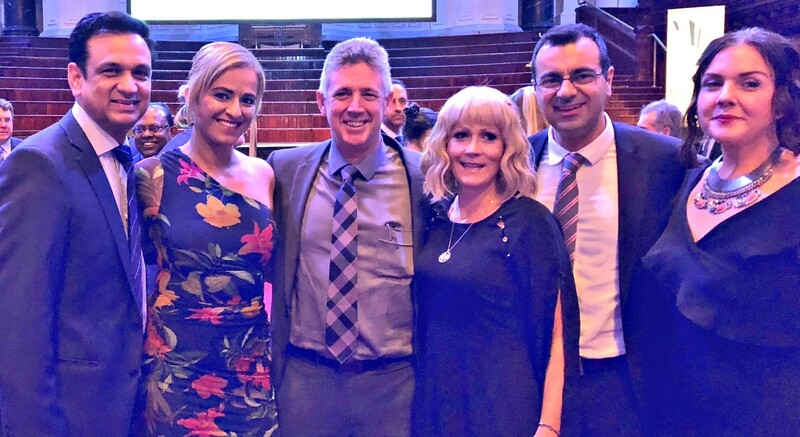 A revolutionary project that has vastly improved waiting times in Blacktown Hospital’s emergency department has won a Premier’s award at a gala dinner tonight. The initiative, called Project RED, has reduced the average time patients spent in the hospital’s emergency department by 80 minutes. The project was nominated in the Improving Service Levels in Hospital category, which recognises teams that have worked on programs, initiatives, innovations or improvements that led to patients receiving more timely and efficient care within the health system. All glammed up: Blacktown Hospital’s emergency director A/Professor Reza Ali, Deputy Director of Nursing Rola Tawbe, WSLHD A/chief executive Graeme Loy, Whole of Health Program Lead Leah Dawkins, Business Analytics and Performance director Luke Elias and Emergency Department nursing unit manager Camille Dooley. Blacktown Hospital general manager Sue-Anne Redmond praised the work of the Project RED team. “Project RED involves key hospital departments, from emergency to cleaning, working together to improve emergency treatment performance and patient flow, and provide the best possible patient care,” Ms Redmond said. Thanks a bunch: Emergency Department nursing unit manager Camille Dooley, Dr Marina Bahgat Wassif, clinical nurse consultant Helen Zaouk, Emergency medicine director Associate Professor Reza Ali and director Business Analytics and Performance Luke Elias. “It has helped reduce waiting times, improved transfer times and access to tests, and improved discharge processes. The project, initiated at Blacktown Hospital, has since been successfully implemented at Mount Druitt and Westmead, and the strategy has been shared with health facilities locally and nationally. “Project RED is clinician-led, so the staff who have to implement the changes led the decision-making,” Ms Redmond said. Ms Redmond thanked the nursing, medical, allied health, administrative and support staff who created the successful project. “Project RED would not have succeeded without support from everyone in the hospital,” Ms Redmond said. “I would like to sincerely thank everyone who did their part, challenged established processes and made this change happen,” she said. The Improving Service Levels in Hospitals Award supports the Premier’s priority to achieve 81% of patients through emergency departments within four hours by 2019.